Written by Dimitris on Feb. 8, 2016 . Last update on Feb. 8, 2016. In June we discussed the theories in Earthquake prediction. Last week we wrote about Lame’s first parameter and Enceladus, the Mythical guy that causes earthquakes when moving underground. Despite the fact that ancient Greeks were blaming Enceladus for any earth tremors in their stories, the great minds of that era were speculating a lot about the natural causes of the earthquakes. 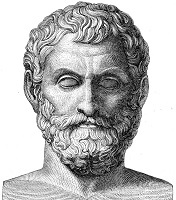 Such theories were included in the writings of Thales of Miletus (c. 585 BCE), Anaximenes of Miletus (c. 550 BCE) and Aristotle (c. 340 BCE). Thales had the theory that earth floats on water, and Thales’s theory about the cause of earthquakes is consistent with that hypothesis . It seems that he applied his floating on water simile to the natural phenomena of earthquakes. It is recorded that Thales and Democritus found in water the cause of earthquakes, and Seneca attributed to Thales a theory that on the occasions when the earth is said to quake it is fluctuating because of the roughness of oceans. Although the theory is wrong, Thales’s hypothesis is rational because it provides an explanation which does not invoke hidden entities. Thousands of years later, we know exactly how these stuff are functioning, and we also describe them with equations. For example, the P-Wave formula. P-waves are a type of body wave, called seismic waves in seismology, that travel through a continuum and are the first waves from an earthquake to arrive at a seismograph. The continuum is made up of gases (as sound waves), liquids, or solids, including the Earth. P-waves can be produced by earthquakes and recorded by seismographs. The name P-wave can stand for either pressure wave as it is formed from alternating compressions and rarefactions or primary wave, as it has the highest velocity and is therefore the first wave to be recorded. You can see the equation on the left, where Vp is the P-wave velocity (m/s), K the bulk modulus (pascal), μ the shear modulus (also pascal) and ρ is the density of the material through which the wave propagates (kg/m3).